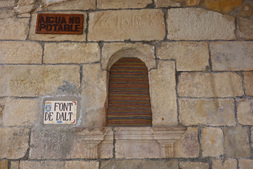 Antropologia, paisagem,sentidos: pesquisa e arte da/na paisagem, residency and conference in Picote at Arribes del Duero Natural Park, Portugal. As part of The Inbetween Collective I was invited to take part at Rising Up, Flowing Down exhibition at the Viennese Watertower to which we contributed with a number of artistic imputs including Handling Source, Method, Sink Tank and Sleep Pods. ​Artist in residence at ACVic as part of CAPP (Collaborative Arts Partnership Programme) selected by Hablar en Arte; working with the colective A+ among other local colectives and individuals in the project Adoberies: reactivating and collaborative processes which ended up in the final event Afluents. Artist workshop leader at Role Models Festival, project by Teple Misto curated by METASITU. August 2017, Ivano Frankisvk (Ukraine). Artist workshop leader at BorderArt workshop. Viadrinicum Borderlab. Borderland experiences: conflict, dialogue and the arts summer school in Frankfurt Oder (in the border of Germany and Poland). For more info about the project created: The Oder Island. Natural-ZONE, installation presented at Institut Français Mauritius during the international workshop "Migration, Identity and Belonging" Mauritius, March-April 2017. Moving while Doing, Nomadic Artistic Perceptions in Socio-Environmental Transitory Times. Awarded with a Moore Institute Fellowship at the National University of Ireland (Galway, Ireland), this project began in February 2017. A project developed during ENCLAVE Land Art Residency in Vistabella del Maestrazgo (Spain) November 2016. Project developed during UkraineLab: Community Development and Local Initiatives in (Post) Conflict Societies. Sloviansk (Ukraine). More info. The land of the Summer People 2014-ongoing. 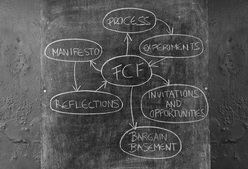 ​FCF is an art research-collaboration that began in 2013 by SFA and BJF in the UK. As it develops we will invite further collaborations nationally and internationally.